Instead, I want to talk about college football! So if you don't live in the south, you may like college football. You might even think you love it. But until you go to a college football game in the south, you definitely haven't lived it. There's something magical about the first game of the season, and it's accompanying tailgate. The very first subtle smells of fall in the air. But it's still gloriously sunny and warm. The energy and spirit from all the tailgates. The seersucker. The frat boys in bow ties. The girls in cute sundresses. Little kids with their faces painted. The smell of the grill. The judgment-free flow of mimosas and drinks before noon. And the food. The food at a tailgate is vital to the success of the tailgate. When we were young and responsibility free, our Saturdays in the fall were spent on campus at Georgia Tech. We had a pretty amazing tailgate group. Every week was themed, and there was even a spreadsheet. We took our tailgates seriously, like good southern kids. So what does all this have to do with huevos rancheros? 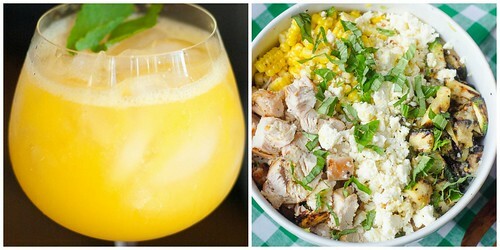 Well, I loved having breakfast at our tailgates - it gave me an excuse to drink a mimosa ;). And I think this would be a pretty fabulous dish to take to a tailgate. Or if you can't go to a tailgate, then it's definitely a pretty fabulous dish to enjoy at home. 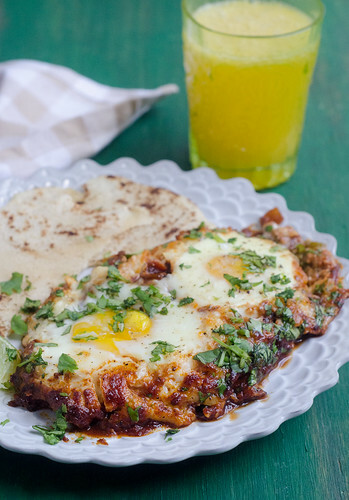 If huevos rancheros is on a brunch menu, there's a really good chance I'm ordering it. But I've yet to master a homemade version. Until now, that is. This version has it all, and it even has a make-ahead option. The method is a bit unorthodox, and it does take a while, but almost all of it is inactive. And the extra time is definitely worth it because the flavors of the vegetables are so beautiful and intense, and balance so well with the spiciness from the peppers. 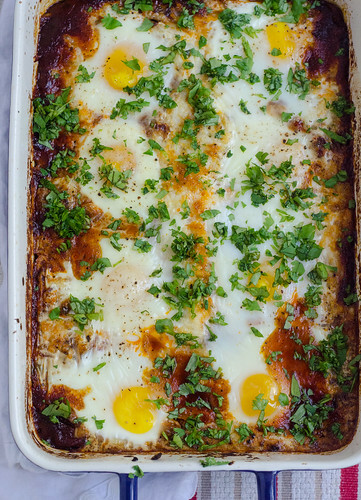 The cheese and runny eggs just put it over the top, and a big plate of these served with fresh corn tortillas is pretty much my idea of perfection. Especially when I can wash it down with a mimosa. Hatch chiles are in season right now, so I used them in place of poblanos here. If you can't find them, using a poblano is more than okay. I also procured some Hatch chile cheddar, which was really great here. Preheat the oven to 475 degrees. Line a rimmed baking sheet with parchment paper and set aside. Set a fine-mesh strainer over a bowl and drain the tomatoes, pressing with a rubber spatula to extract as much liquid as possible. Transfer the liquid to a 2-cup liquid measuring cup and reserve 1 3/4 cups of the tomato juice, discarding the rest. Whisk in the sugar and lime juice and set aside. In a medium bowl combine the tomatoes, onion, olive oil, chile powder, garlic, and 1/2 teaspoon of salt. Spread the mixture into an even layer on the prepared baking sheet. Roast 35 to 40 minutes, stirring halfway through. Remove from the oven and reduce heat to 400 degrees. Carefully crack an egg into each well, then sprinkle the eggs with salt and pepper. Bake until the whites are just beginning to set but still have some movement, 13 to 15 minutes. Remove from the oven, transfer to a wire rack, and cover with foil. Let the eggs sit for 5 minutes. Sprinkle cilantro over the top, and serve. *If you are making this ahead, at this point cover the baking dish and refrigerate until you're ready to cook and serve. If you're traveling with this to a tailgate, I would prepare it up to this step in a grill-safe aluminum foil pan, then cook the eggs on the grill as you would in the oven. Do you or your kids have any weird phobias? Our kids are full of them, but I definitely think Henry and Tucker take the cake. Ready? Up until last week, they were afraid of popsicles. Yes, the dessert. They love ice cream, they love fruit… but not popsicles. There's an awesome popsicle stand at our farmer's market, and our big tradition is to let Caroline and Smith pick out fun flavors while we're there. The first time we did this, we asked them to share with their brothers. They willingly did, but both Tucker and Henry turned away, screaming their heads off in terror. Everyone there just loves our family. Somehow they managed to overcome their fears though, and now they are all about popsicles. I don't know what changed, but I'm glad that they don't live in fear of frozen treats any longer. Especially when said frozen treats are healthy and full of fruits and veggies. I've been busy making them, and the kids have been busy eating them. For the most part, I keep them really healthy, just pureeing fruits and freezing. Every now and then I'll treat the kids with something like these though, just to be nice. My kids also love smoothies in all colors, combos, and flavors, so the next logical step for our popsicle obsession was combining it with our smoothie obsession. 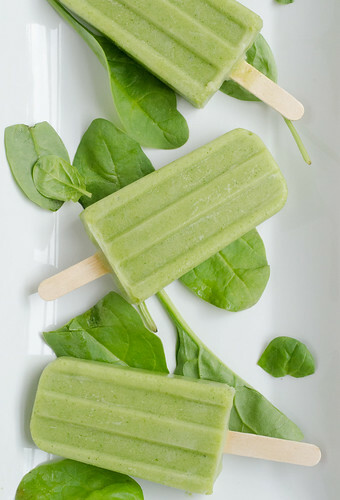 And my kids are legitimately obsessed with these green smoothie popsicles. 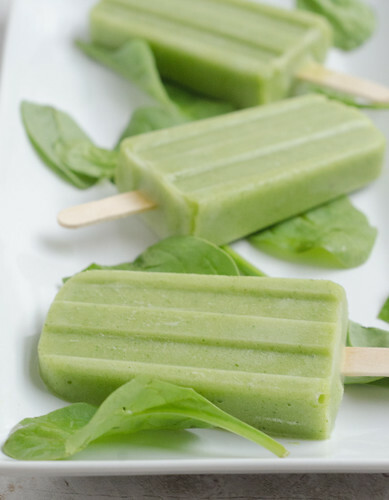 All I did was make a big blender full of green smoothies, then poured it into popsicle molds. You can do this with any smoothie your heart desires! I know that everyone has their favorite green smoothie "recipe," so feel free to use your own. I'm including the general recipe that I use here just for reference, but consider this post to be an "idea" versus a concrete recipe. A popsicle I can eat for breakfast? I'm sold. Combine all the ingredients in the blender and puree until smooth, adding more liquid as needed to get a pourable consistency. Pour the mixture into popsicle molds, and freeze for several hours, or until frozen through, according to the manufacturer's instructions. A few weeks ago, I got a babysitter for the babies, and took Caroline and Smith out for a day of fun. We went to the natural history muesem (dinosaurs! whales! dolphins! fossils! ), then went out for lunch at a great burger place nearby. I'm always a sucker for a fancy burger, so I ordered the Georgia On My Mind: a grass-fed patty, topped with local goat cheese, arugula, and a sweet and spicy peach chutney. It absolutely blew my mind, and after the first bite I was planning to recreate it in my own kitchen ASAP. 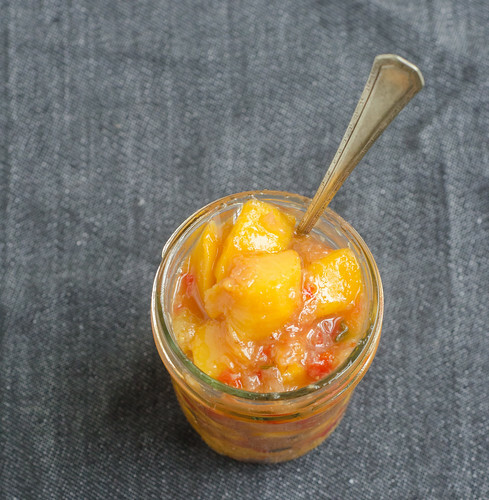 I'd never made peach chutney, but let me tell you - it's so easy, makes enough to freeze (or can), and it goes just swimmingly with pretty much anything. It's got that killer combination of sweet-spicy-sour that I find utterly addictive. I served it with goat cheese over a burger here, but this week I am planning to serve it with grilled pork tenderloin. I'm positive that it would be great with any number of grilled proteins, as a topping for bruschetta, or even over some goat cheese or cream cheese as an appetizer. Oh! Or over baked brie, kind of like this sweet and spicy baked brie I posted earlier this summer! Like I said, it's amazingly versatile, lasts for a few weeks in the fridge, freezes well… basically it's just an all-around great thing to have on hand. 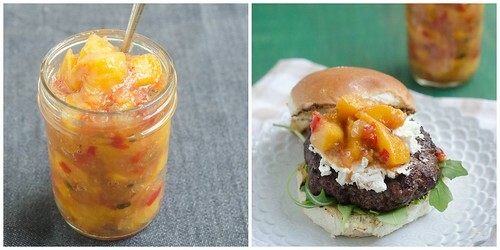 And should you find yourself with some peach chutney on hand, I beg of you: pretty please make this burger? I promise you'll love it! In a medium saucepan, combine the vinegar and sugars over medium-high heat. Bring to a boil and add the bell pepper, onion, jalapeño, raisins, garlic, ginger, and salt. Bring to a simmer and cook, stirring occasionally, for 10 minutes. Add the peaches and any accumulated juices, and cook an additional 10-15 minutes, or until the liquid has thickened and the peaches are soft and tender, but still retain their shape. Remove from heat and cool to room temperature. Serve as desired, or store in the refrigerator in an airtight container. If you're looking for the ultimate southern ice cream, I think this is it. Made by a midwesterner no less ;). But it's got the southern trifecta: biscuits, peaches, and buttermilk. 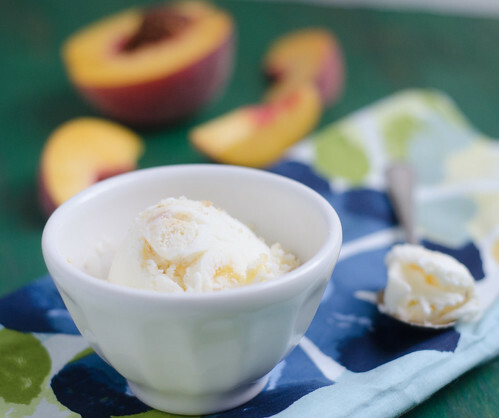 Swirls of peach jam and crispy, buttery, slightly salty biscuit crumbles are mixed into a tangy buttermilk base, creating a great flavor profile of sweet-salty-tangy-creamy. It's good stuff, right here. I was admittedly a little apprehensive about biscuits being mixed into ice cream - it seems like it could have been a textural disaster - but I crumbled my biscuits into really small pieces, so it was just a nice little crispy and salty contrast to the creamy ice cream and sweet jam. In short, I Joey Tribbiani'ed my love for peaches, biscuits, and ice cream, and "put my hands together." I urge you to do the same. Whisk about 1/4 cup of the cream with the cornstarch in a small bowl to make a smooth slurry. Whisk the cream cheese and salt in a medium bowl until smooth. Combine the remaining cup of cream, the sugar, and the corn syrup in a medium saucepan. Bring to a boil over medium-high heat and boil for 4 minutes, stirring periodically. Remove from heat and gradually whisk the corn starch mixture into the cream mixture. Return the pot to the heat and cook, stirring constantly with a heat-proof spatula, until slightly thickened, about 30 seconds. Remove from heat. Slowly whisk the hot cream mixture into the cream cheese until smooth. Whisk in the buttermilk. Cover with plastic wrap and chill for several hours, or overnight. Assemble your ice cream maker and pour the ice cream base into the maker. Freeze according to manufacturer's instructions. Use a rubber spatula to mix the crumbled biscuits into the ice cream, then layer into a storage container, alternating layers of ice cream and jam. Press a sheet of parchment paper directly against the surface of the ice cream and seal with an airtight lid. Freeze until firm, at least 4 hours. Preheat the oven to 450 degrees. Butter a 9x9 inch baking dish. Put the flour and butter in a food processor and pulse 15 times. Add the cream and pulse until the dough comes together into a shaggy mass. Turn the dough out onto a lightly floured surface and knead briefly to bring it together. Fold the dough in half, then fold it over itself two or three times. Press the dough into the prepared pan. Bake 15 to 20 minutes, or until lightly golden brown. Remove from the oven and cool on a rack. Once it's cool, crumble enough of the biscuits to make 1/2 cup of crumbs. Spread them in an even layer on a parchment-lined plate and freeze until needed. Puree the peaches and measure out 1 cup of the puree for the jam. Reserve any remaining puree for another use (recommended: bellinis). Combine the peach puree, sugar, and lemon juice in a medium saucepan. Bring to a boil over medium-high heat, stirring to dissolve the sugar, and boil for 8 minutes (or until it is thickened slightly). Remove from heat and cool to room temperature, then refrigerate until ready to use. Hi, friends! Long time no post. I took a bit of an unplanned break from the blog over the past few weeks to spend more time with the family, wind down summer vacation, try (and failed) to get my house organized, and get Caroline ready to start the first grade (how is the possible). I missed posting, but I have to admit - it was a nice respite for me, and it gave me the much-needed time to clear my head, then immediately fill it back up with ideas for future posts, recipes, and all things Pink Parsley! So in the next few weeks, I have a lot to share: a quick recap of a weekend trip we took to the mountains, the rebirth of my "Feeding my Family" series with a post all about school lunches, and several great recipes that you will definitely want to make before summer's end. So speaking of summer's end, I've been thinking of all the things I still want to make before it's too late. And that got me thinking about all the delicious meals I've made over the course of the past few years. And THAT led me to putting together this post for you all. 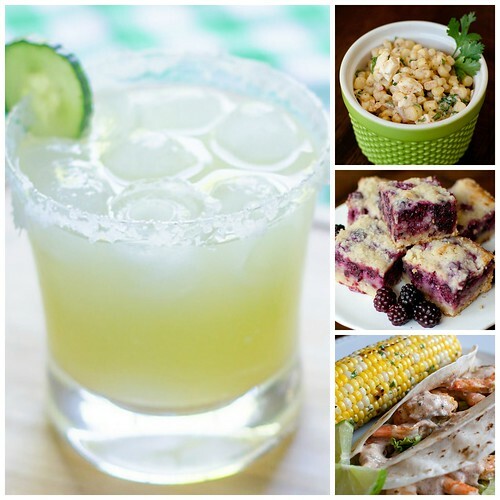 I'm featuring five menus that you should definitely make before Labor Day. 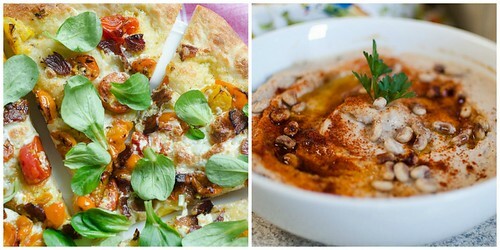 I'm including drinks, apps, and desserts within each menu, but if you're just looking for a quick and easy weeknight meal, feel free to tone it down a bit (or not!). 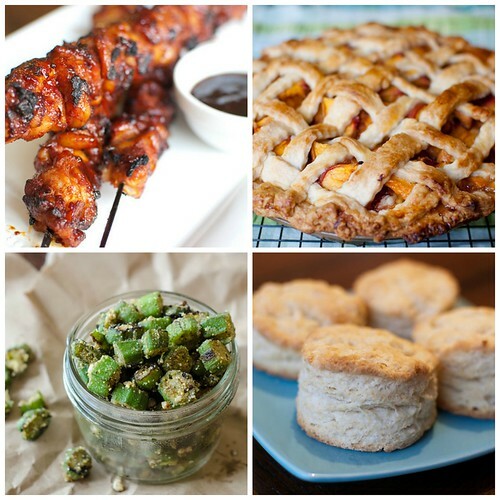 I have made this exact menu three different times this summer for entertaining. In fact, my mother-in-law even requested it for her Bible Study group this weekend. This summer salad has become a classic with me and several of my friends and blog readers, and I beg you to at the very least, make the salad for dinner one night this week! And the ice cream…. I haven't blogged it, but that's purely because I can't keep it it around long enough to photograph it. It is the best ice cream I've ever made, and one that I will be making every year for the rest of my life. 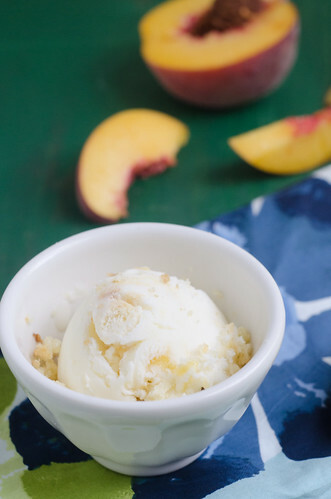 If you don't have an ice cream maker, this ice cream is the perfect reason to buy one. Just simply amazing. This is another meal that I've made several times. When we go to the beach with our friends, each family is in charge of dinner one night out of the week, and this has become our go-to dinner. Now I make it semi-frequently at home as well, and it's another great meal for entertaining. You know I couldn't make a menu compilation without including Mexican food, right? I'm pushing my spicy citrus-grilled shrimp tacos, but feel free to use your favorite taco here instead if you want something else (chicken, ground beef, beer-battered fish, etc). You are also probably unsurprised that I'm including a southern menu, right? 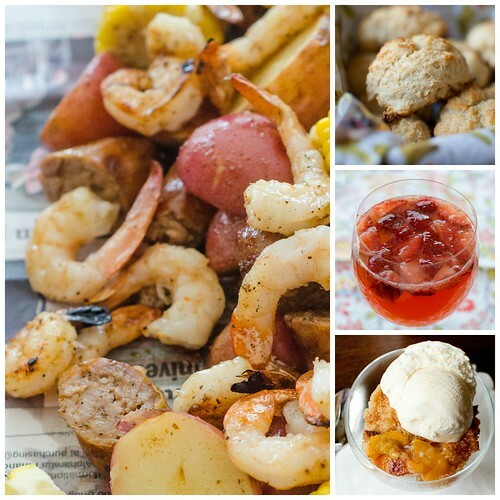 This southern feast will leave everyone full and happy! It's reminiscent of the "Sunday dinners" that we used to have after church, but with updated recipes (and Bourbon!). This menu takes summer classics, and turns them on their head for a fun new spin. This is great for casual entertaining, or just a weeknight dinner with your family. Who doesn't like pizza and rice krispie treats? I hope you found something you are just dying to make this week. I'll be back later this week with some more dinner ideas, plus an ice cream that you definitely don't want to miss out on! Happy Monday! I've had meal-planning ADD lately. I sit down to plan my menu, write it all out, make my grocery list, then decide I hate everything on it and start over. I'm pretty certain that last week I created three separate menus before finally settling on the final version. And I have to say, I'm glad I floundered the way I did, because last week's meals were pretty spectacular! I must do my best work under pressure. Leading the way was this last-minute addition, and ironically, it was just kind of thrown together on a whim. I didn't have it in me to drag all the kids to the grocery store that day, so I needed to figure something out based on what was in the fridge. 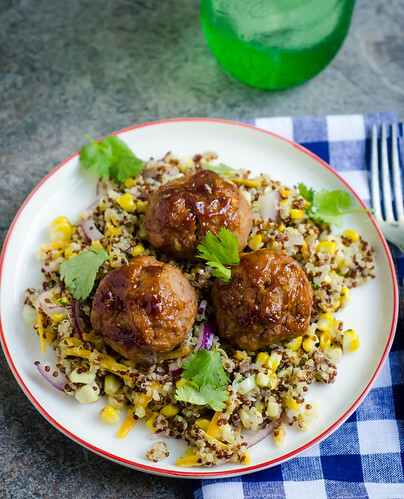 The meatballs are an adaptation of my BBQ chicken burgers, and they were a smash hit. Everyone in my family just devoured these. 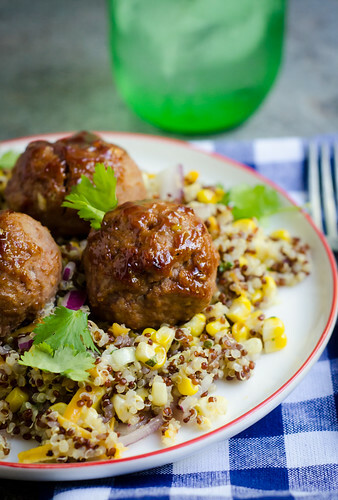 To keep this dinner on the light side, I threw together a grilled corn and cheddar quinoa salad, and the pairing of the meatballs with the quinoa was just fantastic (though I think the meatballs would be fabulous over cheesy grits as well). These would be a great addition to a party spread or tailgate as well, just served as-is. Or topped with melted cheese and turned into a bbq meatball sub. Um, yes please. This was a filling and satisfying summer meal, but it was nice and light as well. The perfect balance between my desire for healthy dinners, and wanting to serve something hearty and filling for the kids. It's a winner all-around. In a large bowl, combine the turkey, panko, scallion, cilantro, paprika, garlic, mustard, salt, cayenne, brown sugar, and 2 tablespoons of the bbq sauce. Lightly but thoroughly mix with your hands to incorporate all the ingredients. Using an ice cream scoop or 1/4 cup measuring cup, form the mixture into balls, and arrange in a single layer on the prepared baking sheet.